Pioneers in the industry, we offer teddyy changing mats from India. 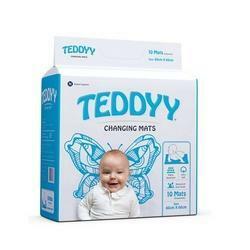 Teddyy Changing Mats are the perfect companion for a child's every activity. Made of soft, spongy material which absorbs faster, the SAP (Super Absorbent Powder) converts liquid into gel to lock it in! The mat's criss-cross design prevents leakages and spills. Teddy Changing Mats can be used as an extra protective layer when the baby is in the cradle, on the floor, in the car or during his massage. Night Long protection for child on Bed. An extra protective layer when the baby is either in the cradle, floor, car or bed. To protect clothes while carrying the baby in arms.